Anne Hathaway's post-baby body is surprisingly, well, normal. 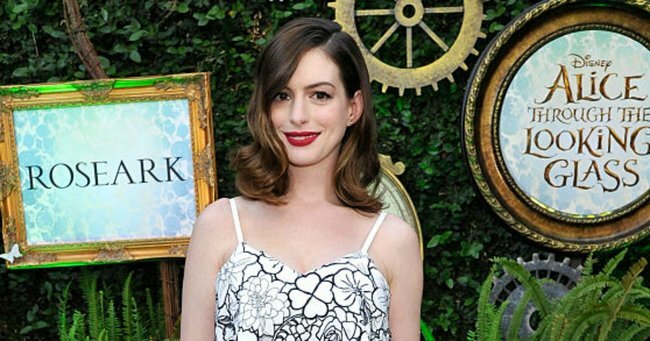 Anne Hathaway proves there's so much more to the first weeks of motherhood than a strict diet. With one stunning red carpet entrance, Anne Hathaway has proved (once again) that there’s more to those first few precious weeks with your new baby than a strict diet and exercise routine. Attending the Alice: Through the Looking Glass premiere with husband and fellow actor, Adam Schulman, 35, the Bride Wars star looked remarkably, well, normal for a mother who had welcomed her first child just seven weeks ago. Anne Hathaway and Adam Schulman. Image via Getty. Hathaway, 33, gave birth to son, Jonathan Rosebanks Schulman on March 24. She was snapped wearing a figure-hugging black and white Disaya Resort dress dress at the premiere, her first red-carpet event since the birth. And she looked positively radiant. Unlike some other celeb mums, who stayed hidden for three months after their first child until their pre-baby bods had bounced back, Hathaway&apos;s stomach showed the smallest hint of a mummy tummy. Anne Hathawat=y and Emily Blunt. Image via Getty. Fellow Devil Wears Prada star and currently pregnant with baby number two, Emily Blunt also attended the premiere and was seen talking to Hathaway. Earlier in April, E! News reported Hathaway was "enjoying every second with her baby boy" and her and Schulman were " loving every minute being new parents". A source told E! News the infant is a "sweet and happy baby". Hathaway&apos;s post-partum body confidence is similar to that of Kate Middleton&apos;s much-hyped first appearance with her first child Prince George. Back in July 2013, Middleton was seen waving to photographers holding the heir to the throne with a very visible bump, having welcomed her son just hours before. While we commend both Hathway and Middleton for taking one for the rest of us who don&apos;t have personal chefs, trainers and carefully calculated post-baby diets, we can&apos;t help but wish this was a more common occurrence. A woman&apos;s body is incredible and giving birth to new life and the body that comes with it is something that should be celebrated, not hidden.